If you’re looking for a place to have a safe and family-oriented Halloween, Ironton Baptist Church is the place to go . 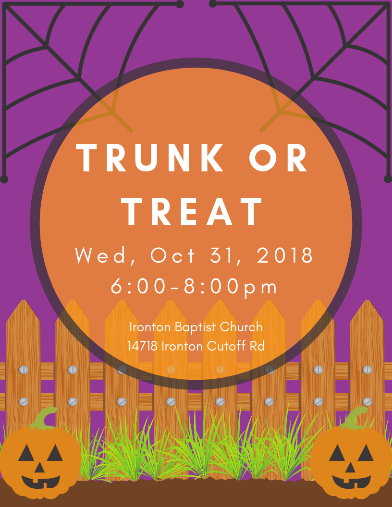 This Halloween, Ironton Baptist Church is having a Trunk-or-Treat event from 6:00-8:00 p.m. It provides an array of events for the community, free of charge. Church members set up vehicles where kids can stop by and trick-or-treat. They also offer carnival-style games in their parking lot. There is a cake walk as well as hot dogs and drinks for those who attend. In addition to the trick-or-treating, provided meal, and games, attendees can register for various door prizes throughout the event. Children have family fun and make good memories. 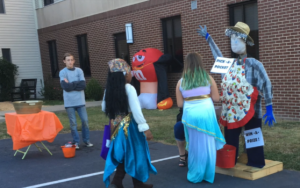 Last year, more than one hundred fifty people from the community attended trunk-or-treat. This year, the number of attendees is expected to increase. Ironton has been doing Trunk-or-Treat for 14 years. It started back in 2004 when the church realized there weren’t very many places in the community for children to safely trick- or-treat. Courtney Yates, a mother of four and a member of Ironton says, “[Trunk or Treat] gives kids a safe place to experience the joy of trick-or-treating without the danger of a bad neighborhood.” As Spencer Chastain, the Youth Minister at Ironton Baptist Church, puts in, “We provide a safe place for children and their families to come trick-or-treating, have a meal, play games, win prizes, and connect with other members of the community.” Providing a safe and fun place to spend Halloween was made possible by one of Ironton Baptist Church’s ministry teams: The Dream Team. The Dream Team plans to put on this event as well as numerous other events as a way to reach out to the community throughout the year. 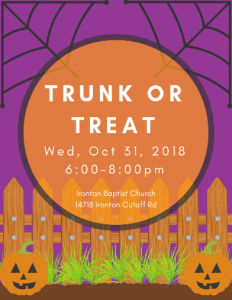 Ironton Baptist Church’s Trunk-or Treat looks like a great place for family fun, community connection, and great memories this Halloween!